How Many Countries Are There in the World in 2019? This article, originally from 2011, has been revised and updated to February 2019. You can view some older versions of the article in our archives. A world political map published by the US government. 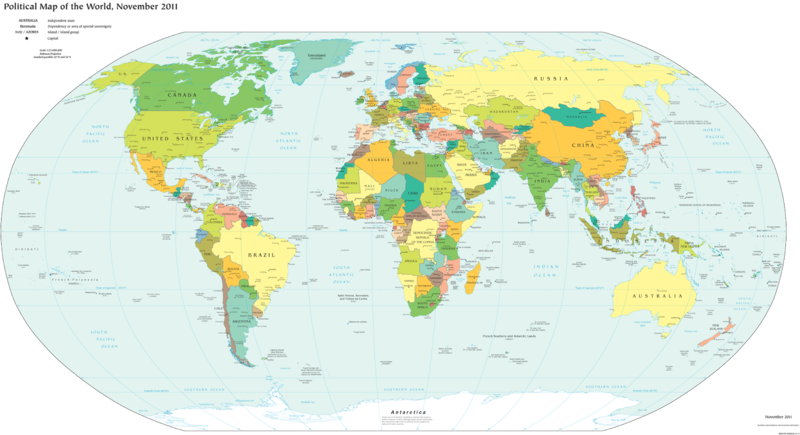 One of the most basic questions for map-lovers is, "How many countries are there in the world?" But anyone who just gives you a number isn't telling the whole truth. It actually depends a lot on how you define a "country". These countries mostly all accept each other as sovereign states, and they're the ones you'll see on most world maps and lists of the world's countries. Almost every country you've ever heard of is probably a member of the UN, and the two UN Observer States are Vatican City (represented by the Holy See) and Palestine. If you want to know the names of all 195, Wikipedia has a complete list. The last addition to the list was in 2012, when Palestine became a UN Observer State, and the last time the number of full UN members changed was when South Sudan joined in 2011. Note: Palestine's approval as a UN Observer State was controversial, so some lists may still only have 194 countries. Several more country candidates are left out of the UN itself, but are still officially acknowledged by at least one UN member (this kind of official acceptance is called "diplomatic recognition"). These controversial countries are usually labeled on world maps as disputed territories or special cases, if they're on the map at all. 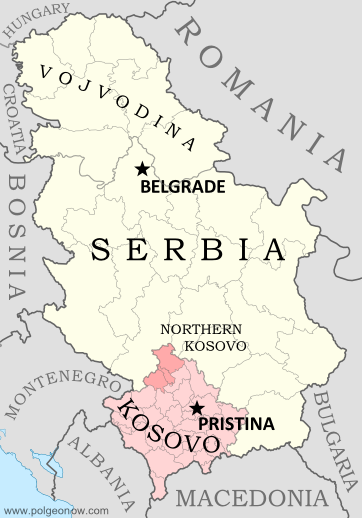 Kosovo is recognized as independent by over 100 countries, but claimed by Serbia. The six non-UN states with partial recognition are Taiwan, Western Sahara, Kosovo, South Ossetia, Abkhazia, and Northern Cyprus. All of these are claimed as parts of other countries, but aren't actually controlled by them (at least not completely). The number of UN members recognizing them varies, from just one for Northern Cyprus to over 100 for Kosovo. A few lists also include the Cook Islands and Niue as partially-recognized states. These two places sometimes act like independent countries, but they've never actually declared independence or tried to join the UN. They're usually considered to be highly self-governing overseas territories of New Zealand. But wait, there's more! Those six partially recognized countries aren't the only breakaway states with full self-governance. There are at least three more self-declared countries that aren't recognized by any UN members at all, but still operate independently from the countries that claim them. These are often called "de facto" sovereign states, a fancy Latin way of saying they're independent countries in actual fact, even if not on paper. The three places most often considered de facto independent countries despite having no recognition from UN members are Artsakh (Nagorno-Karabakh), Transnistria, and Somaliland. And since 2014 there have been three more contenders for the list, questionable because they're located in active war zones and have only limited government structures: The so-called "Islamic State" is almost out of the running now that it's lost most of its territory in Syria and Iraq, but the Donetsk People's Republic and the Lugansk People's Republic, which claim independence from Ukraine, don't seem to be going anywhere. Tiny "micronations" declared by individual people usually aren't taken seriously enough to put on the list. The closest contender would be Sealand, but it's debatable whether this tiny "nation" really counts as having a territory, population, or government, all key ingredients any kind of "state" by most definitions. There are also many rebel-held territories (and fully self-governing areas like Puntland state in Somalia) that aren't controlled by any country, but are left off the list because they don't claim to be independent. They agree in principle that they're part of another country, even though they might disagree about who should be in charge, or how the country should be governed. Lots of people learn about the world's list of countries by watching the Olympic Games every two years. If you're one of them, you might be confused at why the Olympic Parade of Nations claims over 200 members, even though your atlas only has 195 countries. That's because the Olympics didn't always require applicants to be independent countries. Dependent territories with partial self-government have sometimes been approved by the International Olympic Committee (IOC), and a couple of the partially-recognized states mentioned above have also managed it. The Olympics include most of the world's independent countries, and some dependent territories too. About half of the dependent territories in the Olympics are overseas possessions of the US (like Puerto Rico) or the UK (like Bermuda). Some nearly-independent "countries" like the Cook Islands (associated with New Zealand) and Aruba (a "constituent country" of the Netherlands) are included too. Every UN member country is also in the Olympics, with the latest addition, South Sudan, joining in August 2015. The one UN Observer State in the Olympics is Palestine - Vatican City apparently isn't interested. As for the two partially-recognized countries in the games, Kosovo became an Olympic Nation in 2014, and Taiwan has been a member for some time, but has to call itself "Chinese Taipei" after a deal struck with China in the 1980s. Learn More: Parade of Nations: Which Countries Are (and Aren't) in the Olympics? Soccer - or "football" as it's known in many countries - is the world's most popular sport, and most international matches all the way up to the World Cup are regulated by an organization called FIFA. If you're a soccer super-fan, you might know that there are 211 member countries that compete in FIFA matches (even though most don't make it to the World Cup). That's already more than the number of Olympic Nations, and definitely more than the total independent countries on most world maps. Like the Olympics, FIFA didn't always require independence or international recognition for its members. Now it's a bit stricter, but any team that's already a member is allowed to stay. The two newest members, which joined in May 2016, both made it in under special circumstances: Kosovo, a partially-recognized country, was voted in after being recognized by more than half of the UN's members; and Gibraltar, an overseas territory of the UK, recently got a court order allowing it in without being independent. Based on European tradition, FIFA also allows England, Scotland, Wales, and Northern Ireland to compete as separate teams, even though they've all been part of the UK for over 200 years. You might notice that not all of the 193 UN member states are included. That's because several very small countries aren't members, plus the UK is replaced by its four constituent "countries", which aren't UN members on their own. Learn More: Which Countries Are (and Aren't) Part of FIFA? Ever been filling out an internet form, and had to choose from a surprisingly long list of countries? You were probably looking at the international standard "country code" list, formally known as ISO 3166-1. Lots of companies and other organizations adopt this standard list instead of spending their own time compiling one. The standard also includes convenient two-letter codes for each country, like us for the United States, de for Germany, and jp for Japan, which you might recognize from website addresses specific to those countries. This ISO standard is based on an official list kept by the UN...but then why on Earth are there 249 country codes? That's way more than the total number of UN member and observer countries! Well, the standard list does leave out some breakaway states not recognized by the UN, but makes up for it by listing dependent territories separately from their parent countries. In other words, the ISO list is more an answer to the question, "How many countries and territories in the world?" than "How many countries in the world?" This means there are "country codes" not just for actual countries, but also for nearly-independent states, overseas colonies, uninhabited islands, and even Antarctica! This is important, because organizations might need an option for every place that any person can be located, and dependent territories often aren't technically part of the countries they belong to. So there you have it! Next time someone tells you "There are 194 countries in the world," remember that the real answer isn't so simple!